Saint Mary's Day in Romania always falls on August 15th each year and celebrates the belief that God assumed Mary into Heaven after her death. This day is also called Assumption of Mary Day or Assumption Day and is one of the most important feast days in the Orthodox Christian Church. People perform pilgrimages at Putna in Moldavia, Nicula in Transylvania, and Moisei in Maramures with crowds in the thousands. St Mary is also the patron saint of the Navy thus there are celebrations and processions with the navy on this day as well. 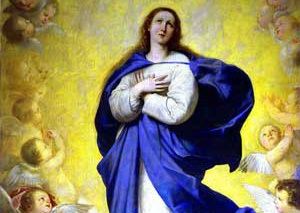 The Assumption of Mary is that Mary as mother of Jesus Christ was assumed into heaven immediately to reunite with her soul and avoid any physical decay while on earth. Provides calendars for the calendar year for Romania. Provides the dates for holidays for the calendar year for Romania.